Average Weight	: 60 - 70 lbs. The Irish Setter was developed from blending several breeds, including...the Irish Water Spaniel, Irish Terrier, the English Setter, the Pointer and the Gordon Setter. 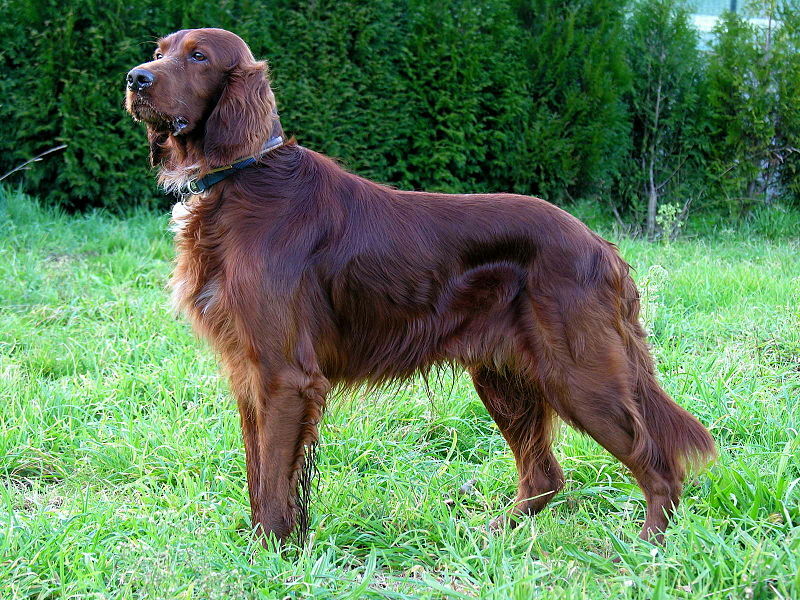 It was originally called the Irish Red Setter when first brought to the United States. At one time the Irish Setter was a red and white dog and had shorter legs than today's breed. As far back as the 19th century breeders of Irish Setters focused on producing a dog with a pure chestnut red coat and breeding out the white markings previously allowed and developed in the breed. The Irish Setter is an all-purpose hunting dog, bred to be both a pointer and a retriever and excellent workers in all types of terrains. Irish Setters have proven themselves to be excellent partners in hunting game birds. Their sense of smell is uncanny and they are also known for their speed and athleticism. When the Irish Setter finds their game they pace back and forth in front of their Master to alert him/her. They also were known to be adept at crouching down low near the bird so that their Master could walk over and toss a net over the prey. A dog named 'Elcho' was the first Irish Setter imported to the United States. & was originally called the Irish Red Setter. He arrived in 1875 and became a star not only in the show ring but also in the field. They quickly became one of the most popular breeds in America and a favorite in the show ring. Today, it's not unusual to see two types: the larger, heavier show dog, and the lighter, sleeker field dog. The Irish Setter's popularity soared in the 1960's & 70's, thanks to the movie featuring an Irish Setter named 'Big Red', as well as during President Nixon's reign in the White House with his Irish Setter named 'King Timahoe'. Over the years many breeders have started breeding more for looks/conformation rather than this breed's hunting ability. The Irish Setter's talents include hunting, tracking, retrieving, pointing, watchdog, agility and competitive obedience. It is believed that the Irish Setter is even older than the English Setter. •	High Energy ~ require lots of daily exercise. •	A perfect breed for joggers, runners, bikers, hikers, and dog sports. •	Athletic, graceful and enthusiastic. •	Not suited for every home. Needs lots of exercise, can suffer from separation anxiety, and can become destructive if left alone for long periods. •	Intelligent, mischievous and independent. •	Puppy like longer than most breeds, slow to mature. •	Good with older children, too energetic for small toddlers. •	Training can be challenging as their inquisitive nature keeps them from focusing on one thing for very long. The temperament of the Irish Setter is gentle, kind and very even mannered. They are somewhat energetic dogs that need to have a place to run and romp as well as regular interaction with their family. The Irish Setter is a very people oriented dog and would prefer to be with then family rather than alone. They do not do well in kennels or small confined spaces although they will easily adjust to living indoors with lots of opportunity for regular walks and time outdoors. As puppies many Irish Setters are rather impulsive and clownish and love to play and spend time with people. They will almost house rain themselves given the chance to get outside after meals and activity times. They are a very intelligent breed that does have natural tendencies to be somewhat independent. The Irish Setter is not a dominant breed nor is it dog aggressive unless provoked. They are ideal companion dogs for almost any type or breed of dog and have the energy to play all day if allowed. The Irish Setter will get along very well with other non-canine pets and is usually very fond of cats if properly socialized. Some Irish Setters are more prone to chasing so raising them as puppies with cats will help prevent this from becoming a problem. Irish Setters are ideal family dogs and love to spend time with children. They are excellent even with very small children and are often found simply walking around young kids out playing in the yard, staying active in what the kids are doing. When properly trained the will respond to even a very young child's command which makes them ideal dogs for families. The Irish Setter has unlimited patience with children and is not aggressive in any way towards family children or guests. The Irish Setter is not a guard or watch dog and will often greet total strangers with a happy expression and a wag of the tail. Often the Irish Setter will bark a greeting to family before they will bark to notify the family that people are arriving. The Irish Setter makes a great traveling, jogging, hiking or walking companion. They are naturally energetic and athletic and are always interested in doing whatever the family is involved in. The Irish Setter has the same Health Problems and genetic concerns that most of the large breeds of dogs have. These include canine hip dysplasia, Progressive Retinal Atrophy and Gastric torsion, a bloating problem that can be controlled by Feeding several small meals a day and limiting Exercise after meals. The Irish Setter has a flat, thick and smooth coat that requires some daily care but not excessive care. The field lines that have the shorter coat require less care than the longer coats of the show lines. Both types of Irish Setters have natural oils in their coats that make them water-resistant and help the coat stay free from dirt and debris. Washing or bathing the Irish Setter breed should only be done when absolutely necessary to avoid stripping these oils from the coat. If the coat needs to be freshened up or deodorized a dry powder shampoo is a better option than a full bath, but even this should be used with limits and very infrequently. To groom the Irish Setter use a stiff bristle brush or pin brush in the direction of hair growth. In the longer coated lines be sure to push the hair backwards then brush back into position to remove even small tangles further up on the hair. The furnishings on the legs, ears and tail as well as the longer hair on the ruff and underbelly can be easily combed with a thick tooth metal comb. The Irish Setter is a highly active breed that requires additional exercise on a daily basis to avoid becoming highly distracted and unmanageable. They are an excellent breed for active families and individuals that enjoy spending time outdoors, regardless of the activity. Irish Setters are natural retrievers and will enjoy running to chase a ball or a stick for as long as the owner is willing to keep throwing. To keep this dog in excellent shape at least one long walk per day is required, especially with the option to run off leash and explore. Since they are a natural scent dog they may have a tendency to get on a trail and follow it, so training must be complete before taking the dog out off leash. In addition this breed enjoys getting into the water for a swim, which is also excellent exercise for the breed. One of the benefits of the Irish Setter breed is that with a large, fenced yard they will self-exercise very well. They do much better with a companion dog that is also fairly active and will engage in play and romps during the day. The Irish Setter is not recommended for apartment life or for very quiet families that are not active. This breed loves to be engaged with people in their exercise and really loves to rough house and play with kids. The Irish Setter does not do well in kennel or run unless for brief periods of time. The Irish Setter is a very intelligent and alert dog that has a high ability to problem solve and think independently. To train the Irish Setter the owner must work with the dog and enter into a partnership, not try to dominant or force the dog into participating in the training exercise. They love to please and will simply follow commands to please the trainer they have bonded with. Spending time and making this dog a part of the families life is key to obedience and training. While not a dominant dog the Irish Setter can be stubborn and somewhat independent at times. Typically they tend to be less complaint when they have not had the correct amount of exercise. Always start training sessions with a game, a long walk, or some time to run off leash to burn off excess energy. Once they have physically exercised this breed is ready for mental challenges. The Irish Setter does not need continuous repetitive instruction and will often learn commands within one or two training sessions. Never train an Irish Setter using harsh or negative methods. They need to feel part of the owner's life and always should be given lots of positive attention and interactions. Since they are a hunting breed they can be taught hand signals or to respond to whistle commands. Irish setters can be trained to compete in various events including agility, obedience, tracking, hunting and retrieving events. They are very self-assured dogs that are not worried about performing in front of people, nor are they shy or timid if properly socialized and trained.